But is there just one groove? Is there one ideal swing? Well, if you’re a fan of Adam Scott, you might be nodding your head in the affirmative manner, emphatically. As technically sound as Mr. Scott’s swing is, us mortals will never come close to that level of perfection—and repeatability. And there have been so many other odd, unteachable swings that have been quite successful as well. It is for this reason that I believe it’s better to make the most of what you have, and find a way to make the instinctive work with you, not against you. As we’re rebuilding our swings for a new season, I think this is a timely discussion. Or, to put it another way, maybe we should start with looking at your strengths and weaknesses, and admit where we are. And, maybe even start with our unique anatomies, and build from there. Instead of trying to achieve—and ultimately failing—to achieve an unattainable ideal, let’s build a repeatable swing from the ground up, as it were, based on our natural abilities. I was in this vein of deliberation when I came across a tip in Golf Magazine by Jessica Korda. And I was struck by its common sense approach and the fact that I had never heard of this tip before in all my readings and video watchings. The tip posits that everyone has his or her own natural left hand position, and that’s the one you should be using. It’s so easy to try, and it seems to work! Korda instructs: "Stand behind the ball and grip the club with your left hand only. It's simple: Just grab the handle without looking. This sets your left hand in its natural power position." Natural power position? Could it be that easy? 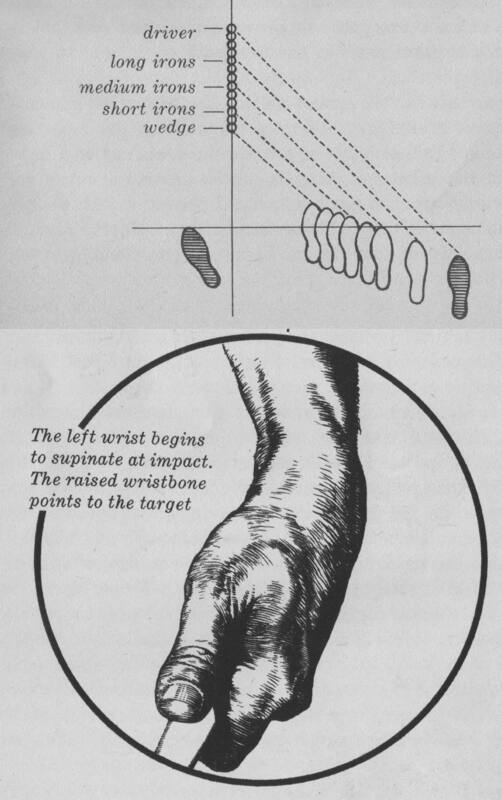 Korda goes on: "Depending on your anatomy, your left wrist will be either flat or flexed. What's important is that you maintain your left wrist position as you swing. Changing it disrupts your hitting instinct. Take note of the flex and accept it." Yes! Accept what’s natural because it encourages and supports your hitting instinct. This idea made so much sense to me, I ripped the page out of the magazine and have kept it out on my desk ever since. But now turning to the other extreme, Mr. Hogan, I have long had some rhetorical—and not-so-rhetorical—questions about his alleged "secrets" bouncing around in the back of my head. In the image here are two perplexing parts of his elaborate ruse on the golfing public. First, if Hogan was the greatest ball striker ever, why doesn’t anyone today follow his advice for adjusting the stance for the length of the club? (See image.) Every pro or accomplished player around these days is pretty much square to the target line on every shot. In the image on this page, the top half illustrates Hogan’s strategy on stance. His argument is that the hips need a little more space to get out of the way of an ideal swing plane for the longer clubs. Why no one follows this advice today is probably a conundrum that has no answer, redundancies aside. Another perplexingly revealed element in Mr. Hogan’s quiverful of secrets is when he tries to describe how the wrist (ideally) rotates and bows simultaneously near impact. The dictionary says "supinate" means: "to turn (or hold) a hand so that the palm or sole is facing upward or outward." But it’s always been my assertion that Mr. Hogan had a unique definition of "supinate" in his head that he never shared. One person brave enough to try to parse out anatomically everything that’s going in in Hogan’s wrist at the millisecond before impact—and succeeds as well as anyone—is Kelvin Miyahira, on the Around Hawaii website. Of course, Kelvin says in the title of the piece that you have absolutely no chance of replicating what Hogan does, so you might stop trying before you start. Or maybe try strengthening your left wrist like one Hogan legend claims he did—by banging his left fist down repeatedly on a bedpost. Or maybe we should all just start with what comes natural, like Ms. Korda suggests. That sounds like more fun. Well, it was a good run. A full 40 years of the carousel carnival ride that was Eldrick, in various but cyclical and somewhat predictable left turns of anticipation, drama, tragedy, redemption, expectation—and fun! There are so many somber and clever ways to sum up the greatness of the golfer separate from the man, but one always rang the most true for me. It was an offhand comment by a longtime PGA Tour color-commentator. The conditional sentence he posited crystallized how many felt about Tiger’s obvious supremacy. If the goal of golf is to hit it far and straight and get it into the hole the fastest, Tiger’s particular combination of talents accomplished this with startling efficiency. The commentator in question was Ken Venturi, and I think he hit the nail on the head when he said conclusively (paraphrasing): "If PGA Tour events were played on courses that consisted of 18 580-yard par-fives, Tiger would win every tournament." Hard to argue with that assessment. "In addition, the look in Tiger’s eyes has an intensity that I've seen only a couple of times before. To me, it appears that winning isn't enough—he wants to drive his opponents into submission, to bury any doubts of his supremacy, to lap fields of mortals, and to reveal the weaknesses of his opponents so that they'll limp home broken men." Bold predictions of the past now seem a good deal less hyperbolic now. And so we must bid adieu to an era of unprecedented dominance. Indulge me to refer back to some highlights that you might have forgotten, from a number of different perspectives. First, let’s hear from the man himself, with Tiger’s favorite shot of all time. Then there’s Tiger-worshipper Feherty, with his own favorite Tiger shot, and an added bonus of an Ernie Els unbelieving reaction. 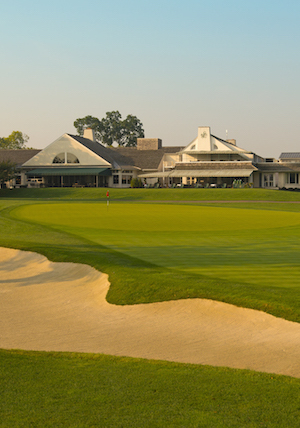 Two of my own personal jaw-droppers are a shot from Medinah Country Club, at the 1999 PGA Championship, I believe, and at the Memorial on an otherwise routine day. And let’s review the most exciting nine holes I’ve ever witnessed, at the 2008 U.S. Open at Torrey Pines, the back nine on Saturday. The iron shot out of the right rough on 13 to set up an eagle is at 15:52 is just phenomenal, and the slow motion replay at 17:11 is worth studying for its perfection. In that same back nine, the chip-in birdie at 17 starts at 26:40, and the painful 18 tee shot starts at 28:30 (slow-mo at 29:23). Not to mention the hobbled five-wood approach shot that set up the eagle at 18 (at 30:00). And for Tiger haters... Yes, he had fun himself some times, this one time joining fellow pros skipping balls off Augusta National’s 16th pond. And yes, he loved saying "GOD-d***-it!" (Here’s a collection.) And if schadenfreude is your thing, watch a Top Five moments compilation of Tiger in pain. Now if you ever wonder why Tiger has had so many back surgeries, take time to watch this Top Five miraculous shot compilation. The first two crazy swings in the video, #5 and #4, would give a circus contortionist pause, but I recommend freezing the frame at 0:59 and wincing in empathy. And to conclude, I leave you with two over-the-top struts from the Best Ever: I’ve named them "The Hold That Pose I’m the Baddest Badass Walk" (to seal a President’s Cup victory) and "The Twirl with the Foregone Conclusion Walk" (to set up a short eagle putt on 15 at Augusta). Thanks for the memories, Tiger, and thank you YouTube channel compilers for your tireless, thankless work. Revered or smeared, lionized or oft chastised, a man of esteem or the Perennial Mr. 14, indubitably, Eldrick the Great will be greatly missed. I take my responsibility to you, the readers, to scour the YouTube for the most useful/entertaining content. It is a responsibility I do not take lightly. If you’re bent on finding some swing theory ideas and mechanical recommendations for your own game, there is no better place than YouTube to disappear down the rabbit hole of high hopes and dashed dreams. Many topnotch instructors have great ideas but less-than-great methods for communicating those concepts. If you scour YouTube long enough, you’ll actually be disappointed in the amount of instruction from the Master himself, Ben Hogan. Little snippets appear here and there and, of course, there’s an endless supply of secondary theory building on Hogan’s precepts outlined in the beloved "Five Lessons" tome. There is one man, under the username "myswingevolution," who has attempted to model his swing as absolutely close to Hogan’s as he can get. He did a decent job, actually. But my favorite YouTube swing analyst has to be Wayne DeFrancesco. If you’ve lived in the Mid-Atlantic region for the last couple of decades, you’ve likely come across his writings in Washington Golf Monthly or GolfStyles magazines. His articles were rather wordy, but he always had interesting things to say, and he’s an undeniably accomplished teacher. At Wayne’s YouTube homepage, you can find detailed analyses of many of the greatest golf swings of all time—and with a bit of humor thrown in for good measure. But my favorite Wayne videos are when he takes TV analysts to task on their sloppy surmizations (yes, I made up that word) on some of the swings they are observing on Tour. Two of his favorite targets are Brandel Chamblee and Johnny Miller. When Tiger was having some control issues a few years back, one common diagnosis among commentators was that he was "dipping" his head excessively on the downswing. After watching a few of Wayne’s video analyses, it has become clear to this misguided golfer that "Keep your head still" is the worst advice possible. In one video analyzing Tiger’s swing, Wayne demolishes Johnny Miller’s comments about the "dipping." Tiger has always done this, as have many greats. Wayne also goes on to show how Tiger’s torso is at an angle to the ground that few golfers have ever consistently been before or since—about 25 degrees from the plane made by the ground. (You can go right to that segment of that video here.) Along with head movement, obviously, is posture. In his analysis, Wayne also calls out Johnny because Johnny himself had quite a "dip" in head position in his prime. (That comes at the 3:00 mark.) Wayne points out that Tom Watson, standing behind, doesn’t even want to watch all the movement that goes on in Johnny’s swing, lest he be infected by it. Indeed, in his prime, Johnny moved just about everything in his swing in a violent fashion, including his feet. Where his left foot started and where it ended are amazing to watch today, as this short video and this short video show. The only golfer I can think of that moves their feet this much is—you probably guessed it—Bubba Watson. Wayne also takes dead aim at "Maintaining Posture" in a swing, and the silliness of that concept in modern golf instruction. All this talk, I believe, amounts to what Mac O’Grady used to call "conservation of momentum." Think of it this way. The closer the club is to the axis of rotation, the faster it can go. Try this experiment. Sit in swivel office chair. Start spinning the chair as fast as you can. Then alternately stick your arms and legs out laterally and pull them in. You’ll find you go much faster with your limbs closer to the axis of rotation. Food for thought, I suppose. The most head movement I could think of is Lorena Ochoa, who takes it to another level. It seems many women pros are okay with "leaving" their head back, or tilted, to promote a consistent plane and a proper release. But that’s just my personal "surmization." But many of the greatest male pros of the last century had a related head movement that is subtle but meaningful. As these players come into the impact zone, their heads, still behind the ball, would move further behind the ball. Sam Snead is a good example, and you can even see it in Tiger’s swing near his prime. This move seems to transfer an extra amount of power from the weight transfer into the ball. More YouTube research is obviously needed. And for one last perspective on head movement, here’s Tiger’s swing from a camera in his hat. Happy YouTube surfing! The two holes of the week are similar in style, but mirror images of each other. Great straightaway, or "freeway," holes are not as easy to make interesting, so when they do, it’s an achievement. Both of these holes have length from the tips, which gets your attention right away. 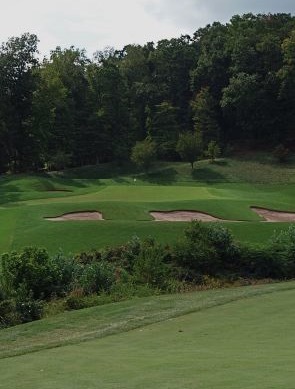 In addition, with only minimal elevation change, the fairway hides your view of the green. 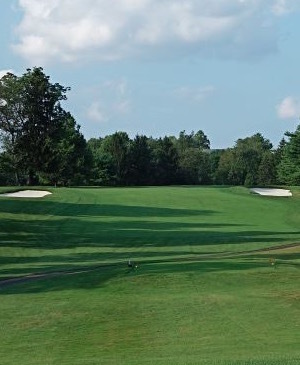 The Public Hole of the Week is Wyncote’s straightaway par 4 #11, which has no fairway bunkers but begs you to shoot down the left side, closer to rough on a steep slope and closer to OB. The mirror of that is the Private Hole of the Week, straightaway #15 at Doylestown. 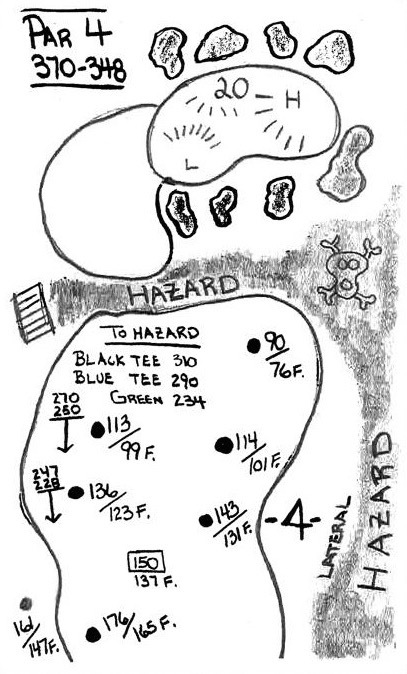 This hole has fairway bunkers that might come into play with some weaker shots, and OB down the right. Both are better played as slight doglegs. Playing the less aggressive line will give you a bit longer shot, but the landing area away from trouble is actually more forgiving and flatter for your approach.